It was not until the mid-twentieth century that Ennio Golfieri identified this work as the one commissioned by the Dominican Order in 1483 to Biagio d’Antonio for the high altar of their church. The work had an official function, being the altar piece for the high altar of the church of an Order of Preachers and certainly Biagio d’Antonio had to conform with the austerity and severity of the Dominican commission. The triptych, set in a Gothic frame, depicts the Virgin on a throne in the centre with the Infant in her arms, still stylistically reminiscent of Verrocchio, and to the sides the figures of the saints that recall the school of Domenico Ghirlandaio. 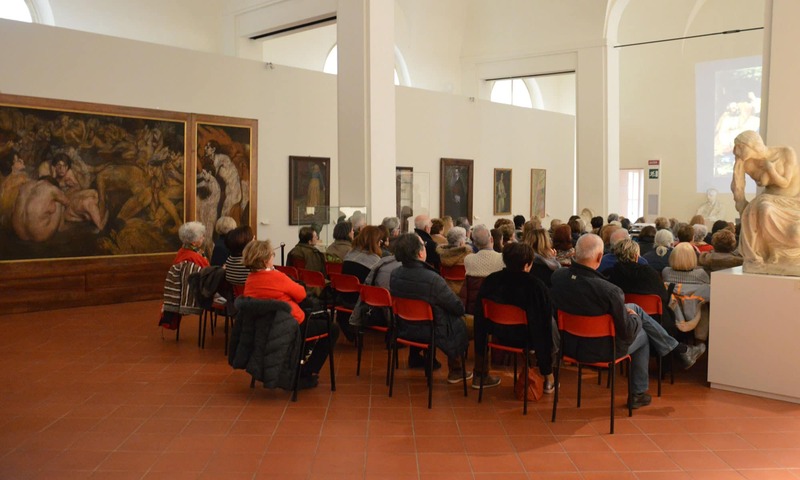 One must not forget that at that date, D’Antonio had recently returned to Faenza after having collaborated with Ghirlandaio on the frescoes of the Sistine Chapel in Rome. Significant aspects of the work are the meadow abloom at the foot of the Virgin, the presence of vases of flowers on the throne, according to Flemish models and some brilliant anatomic and luminist details in the saints to the right.